The winter is gone and spring just arrived with beautiful sun over the skyline of London. During the winter season together with the London chocolate group I checked a few of the recommendation I collected from the experts for the best hot chocolate cup in the capital. Chocolate as it's known to us is a new development and the first chocolate bar was produced only just over 150 years ago, but chocolate in a form of a drink was consumed by the Mayan people. It wasn't made of milk and wasn't sweet. I learnt that there are several methods to make hot chocolate. Melted chocolate with no cream or milk. This version is very thick and dense and if the chocolate doesn't have much sugar content and come in espresso cup it can remind drinking a shot of espresso. 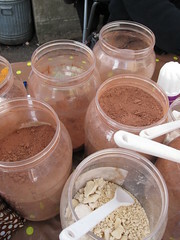 Chocolate powder or chocolate broken to small pieces whisked together with hot milk. Some places instead of milk the hot chocolate is made with water and spices (cardamon, cinnamon and chilli) or an alternative to dairy milk soy, almond or oat milk. In this post I wouldn't rate the quality of the drink in the different shops, but I'll try to tell the story of some of the more interesting shops/stalls to get your dose of hot chocolate in the capital. Let me start with a nice cafe that organise every November a hot chocolate week and everyday they serve different flavour of hot chocolate. Unfortunately I missed the chance last year to try their hot chocolate during the festival, but last week I had their normal hot chocolate. The name of the cafe is the Fleet River Bakery near Holborn station. The lady who prepared the drink pour a large spoon of chocolate power in a mug and steam in the espresso machine and pour the hot milk. The result was OKish drink. Next are the gelato parlours. La Gelatiera is located in Covent garden area. It is artisan gelato parlour, where you can watch how they prepare the gelato via a glass floor. 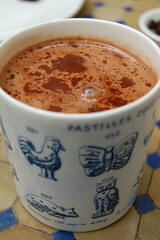 They serve interesting dark hot chocolate, for the one who like their drink sweet sugar is provided as it's not sweet. In the same area located Gelatorino their hot chocolate is a thick version of hot chocolate. Next in the list are the markets. Jazz and Juls during the winter months they sell hot chocolate (mostly on weekends) in different flavours and you can also choose to have the vegan option that they use oat milk. This year they were in Camden and Broadway market, but you should check on their website where they'll be located next season. Most of the chocolatiers in London serve hot chocolate. I should mention Melt in Notting hill, Artisan du Chocolat at their Westbourne Grove store, Melange chocolate in Peckham, Niko B Chocoaltes in Daltson and Cocomaya off Sloane square and near Marble Arch. Thanks for the mention Sela, I know you love your hot chocolate !! You're right Isabelle I know what is a good chocolate.